The fishing has been good to say the least. The nearshore bite of Atlantic Bonito is still happening but is starting to slow down as the Spanish picks up. We have been catching nice size Spanish on the troll and casting as well. The Cobia will be on the beach anytime and the Kings will not be far behind. The Dolphin have showed up in a big way offshore. If you want to get in on some of the best Mahi fishing of the year, now is the time. There are still a few Wahoo and Tuna being caught. Blue Marlin should be feeding on the Mahi, so don’t be surprised if you see one on a Gulfstream trip. The Grouper and Seabass have been biting well on the bottom. 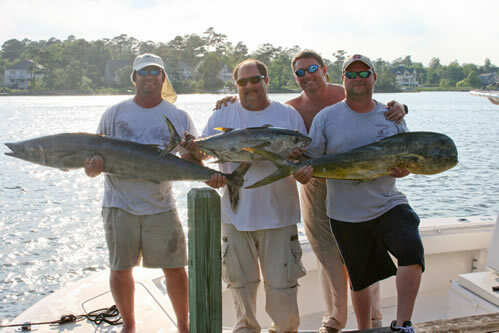 Call to book your trip and get in on some of the best offshore action of the year. Like us on Facebook/ Bad Habit Sportfishing to see our pics and videos. 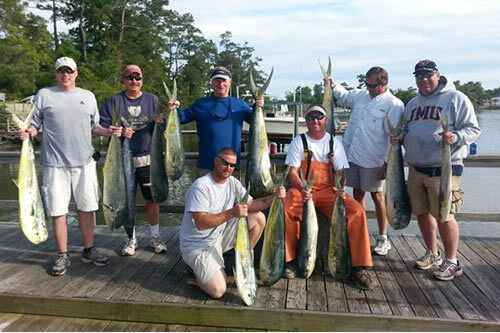 You are currently browsing the Topsail Beach Charter Fishing blog archives for May, 2014.